Facts you need to know when you travel in Germany include public transport, driving in Germany, opening hours, accommodation facts, dining out and emergencies. Travel Germany without hassles. 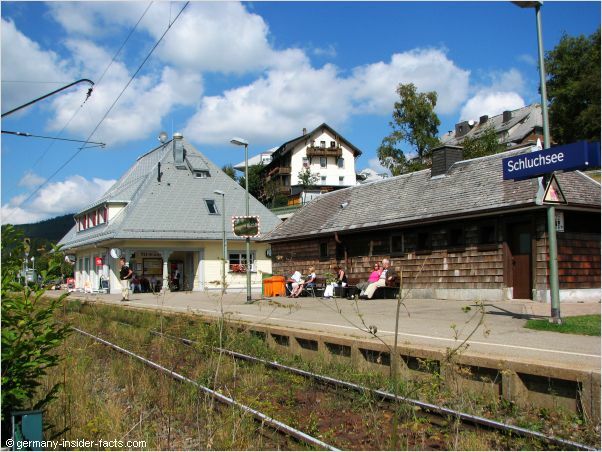 Know what is different in Germany, get essential tips to plan and enjoy your holidays. Whether you explore a particular German region in depth, or you visit the highlights of Germany across the country, it will put your mind at ease to know some basic facts about how to get around and what everyday life in Germany is like. Use the links for a quick jump to a certain topic. Germany has a compact rail network. You can reach almost every corner by train. Actually, the entire public transport system is very efficient most of the time. 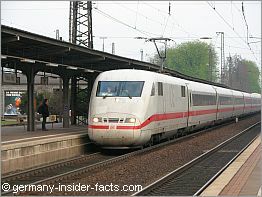 Long-distance trains connect the major cities while regional trains run between smaller cities and towns. Your destination has no train station? I bet there is a bus service from a nearby town. For long distance trains it is highly recommended to make a seat reservation (Sitzplatzreservierung). Buying a train ticket alone is not sufficient, you need to purchase the reservation additionally at low cost (2€ to 4€). Some connections are fairly busy, you could end up sitting on your baggage in an aisle for hours if you don't have a seat reservation. Regional trains don't take reservations. If possible avoid the daily rush hours when commuters crowd the trains. 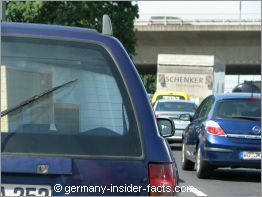 Driving in Germany can be fun, and it can be a nightmare, depending on the traffic. Most Germans love driving. I will give you a few tips to make your journey by car most enjoyable. Whether you bring your own car or you rent a car in Germany, there are a few facts you should know before you arrive. Drivers in Germany need a valid driver's license (Führerschein). The vehicle's registration documents and proof of third party insurance must be carried with you when driving in Germany. Cars registered in other countries either need an European number plate with the country code included, or you must put a sticker with the country code on your car. An International Driver's License (IDL) is not required, it is only valid along with your national driver's license anyway. However, an IDL can make things easier if you hire a car. To rent a car in Germany is easy. You can rent a car at international airports, at railway stations and in major cities. To be sure to have a car waiting for you, you can book it online before you leave home. Just in case you face health problems or have an accident in Germany, this might be useful information. 112 is the emergency number to call the police, ambulance and the firebrigade in Germany and in all countries of the European Union. You dial the 112 in life threatening situations and to call the police after an accident. The call goes to a public safety answering point (Leitstelle) who coordinates calls and sends the needed service immediately. A pharmacy (Apotheke) is the place to ask for help with minor health issues and to buy painkillers and remedies if you catch a cold. Many drugs are only available with a doctor's prescription (Rezept), antibiotics, for example. In Germany medicine is apothekenpflichtig that means it is only available in a pharmacy. A chemist (Drogerie) sells all the stuff for your personal hygiene, like soap, shower gel, tooth brushes, and also baby food, vitamines and things like that. You won't get drugs at a chemist's in Germany. Pharmacies are open Monday to Friday from 8 am to 6 pm, sometimes longer. On Saturdays they might close earlier. In rural areas Apotheken are often closed on Wednesday afternoons. If you need a doctor, look out for a general practitioner (Arzt für Allgemeinmedizin, praktischer Arzt). In Germany they are often called Hausarzt. Doctor's surgeries are usually open from 8 am to 12 pm, Monday to Friday, and again for three to fours hours in the afternoon, except Wednesdays. If you need medical help outside these times, ask for the medical emergeny service (Ärztlicher Notdienst) at the hotel reception, or look it up in the local newspaper. Health care is fairly good in Germany, it can become expensive as well. It is highly recommend to have a travel health insurance while you visit Germany. Until 2006 the federal Shop Closing Law (Ladenschlussgesetz) regulated closing times of shops in Germany. This law was changed often over the years, always to allow longer opening times. The last version of the federal Ladenschlussgesetz allowed opening hours from 6 am to 8 pm from Monday to Saturday, with a few exceptions. Sundays and public holidays shops were closed, again with a few exceptions. In July 2006 the much debated Ladenschlussgesetz was handed over to the sixteen states. Since then the states are allowed to pass their own law regarding opening hours, and most states used this opportunity. Only Bavaria and the Saarland still apply to the old law. Many states abolished regulations from Monday to Saturday completely. Shops could stay open 24 hours during the week, but they rarely do. As a result, you'll find various opening times throughout Germany. Supermarkets are usually open from 8am to 8 or 10pm. Department stores open from 9am to 8pm. Small stores usually close at 6:30pm, while bakeries and newspaper shops open very early, and close at 6pm. Shops are closed on Sundays and public holidays with a few exeptions. Depending on the state, shopping Sundays can be held four or six times a year. Bakeries (Bäckerei) usually open 3 or 4 hours on Sunday mornings. Fuel stations (Tankstelle) are open on Sundays during the day, in major cities and along the Autobahn they are open 24 hours every day. Fuel stations also sell soft drinks and alcohol (beer, wine, schnapps), basic food, newspapers, cigarettes, and other useful items for travellers. During summer you also get a bag of charcoal for your barbecue. In tourist areas and health resorts souvenir shops can open on Sundays as well. There is one fact visitors to Germany often think is very strange - German double beds! Unlike many countries around the world, a double bed in Germany consists of two single beds fastened together. 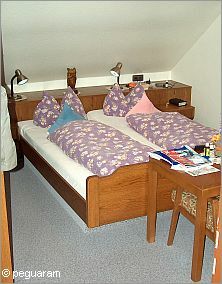 The fact that a German double bed has two mattresses and individual bedding is quite unusual for visitors from abroad. Call me unromantic, but that's what I miss most when I travel abroad - my own bed! I just hate it to fight with hubby for my part of the duvet. Another fact travellers often complain about that German hotels usually don't offer toiletries, you know the small samples of soap, shower gel and shampoo you get in the large hotels. The same about hairdryers. You can only expect these things in the large luxury hotel chains. So you better carry a piece of soap and a small travel hairdryer with you. Don't let these minor oddities spoil your holidays. Check my German hotels page for more information about accommodation types in Germany. The range of restaurants in Germany is huge, and the culinary delights alone are worth to travel to Germany. 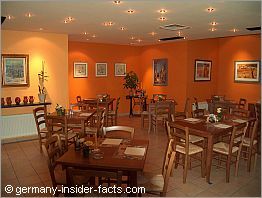 Whether you prefer simple German foods (Hausmannskost) or fancy dishes, you'll find the perfect restaurant in Germany. Additionally, immigrants offer more variety to the German restaurant scene. Greek, Italian, Turkish and Asian restaurants are waiting for you if you want some change from the hearty German cusine. When you go to a restaurant you'll discover that there are a few customs different to other countries in the world. Don't wait to be seated. Just look around to find you an empty table. When the restaurant is busy, you can even sit with other people at the same table. Just ask "is this seat availabe" - "ist dieser Platz noch frei?" Don't expect free water or bread rolls on the table. If you want water you need to order and pay for it. When you order just water (Wasser), you usually get a small bottle of sparkling mineral water (Mineralwasser), or ask for a stilles Wasser, that is without the bubbles. In some (better) restaurants you will get a free appetiser if you order a warm meal. This is usually some bread and butter, curd cheese (Quark) or lard (Schmalz). You don't need to order at the counter, the waiter/waitress is coming to your table. To give a tip (Trinkgeld) is not compulsory, however, if you enjoyed the service, a tip of 5% to 10% of the bill is appropriate. If you feel badly treated, you don't have to give a tip. In Germany a fee for waiters is already included in the bill. Don't leave the tip on the table, give it to the waiter when you pay. Be aware that many restaurants don't take credit cards, especially smaller ones in rural areas.